So after a stupid and demoralizing loss game2, my chances of winning was gone. That didn't mean that i would quit however. 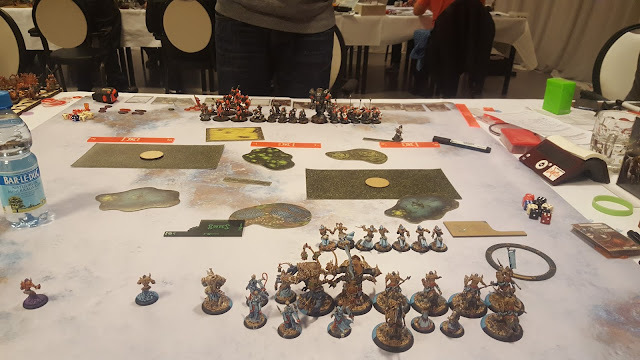 I came to Holland to play, and to prove that Skorne can still play strong competitively. 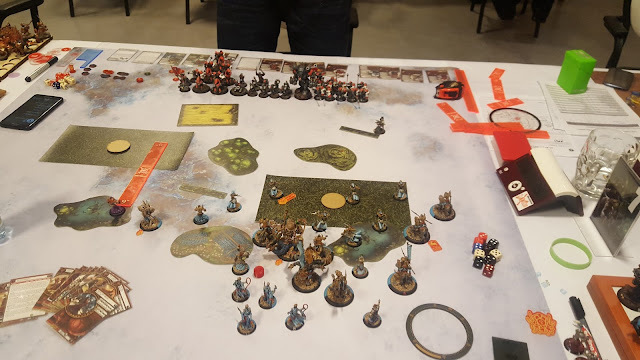 Game 3 was up, andon the other side of the table was Marc with his Khador. I don't remember his second list, but he Had Irusk2 at least. I really wanted to drop Makeda. But the fear of getting list-locked, and the fact that both his lists seemed like a nice fit for Mordikaar convinced me to drop him instead. So. There's a lot of Shooting. And he kinda sorta negates my Feat. Luckilly for me, i still have some Anti Shooting tech in Stealth and the Feat, and my entire list is designed to massacre Infantry. I want to get up the board as fast as possible, remove Scenario Threats and engage his lines as soon as possible. The Scenario is Entrenched, and i get to go first. He gives me a side with a nice house to hide Mordikaar behind. I deploy most of my stuff behind my own zone. The idea is to have Mordikaar hide behind the house until i have cleared enough stuff to Safely move him in to score. Meanwhile i have the Raider and Void Spirits on my left flank opposite his zone . Void Spirits are nice contestors as he doesn't have too many magical attacks, and the Raider can start shooting at things if he moves for his zone. He deploys pretty centrally with the Pikemen opposite my zone and Iruskwith the Uhlans ready to move over to his own. I move stuff up, taking care not to let him fire directly at me. I forget to take a picture after his turn. 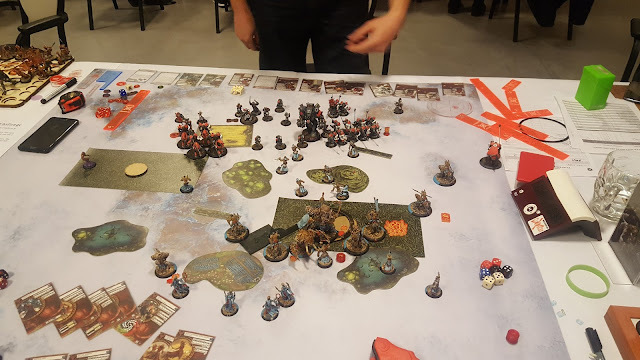 He moves stuff up and tries to scatter a few templates at me, two bloodrunners bite the dust.Uhalns create a fort around Irusk at the edge of his Zone. Just outside of 9.5" of the Void Spirits. I make a big mess of my activations. Both forgetting to use Apparition, and activating my handlers too early, meaning i have some Fury issues. Without the extra 2" from apparition i can't Jam him properly, but i do the best i can with the bloodrunners. Despoiler, Gladiator and Radheim create a fort around Mordikaar who advances a bit to get everything in my Feat. I placed Radheim on the wrong side though.. (He should be on the left side so as to threaten Irusk if he advances.) Lessons learned i guess. Void Spirits runs into his zone to contest, I make another mistake though as i place one of them within 4" of his objective. Raider shoots and kill an Uhlan. Unfortunatelly, i forget to take pictures the rest of the game.. Most of the Bloodrunners die, but otherwise my army survives relatively intact. Orin takes advantage of my slight positioning mistake and kill a void spirit by arcing a Chain lightning off the objective. Pikemen combine to kill two Ferox and Reposition to contest my zone. Uhlans try to kill the left most Ferox, but fails. Three of them box in Irusk who tries to magic the remaining Void Spirit, but he fails. He's now really exposed, only camping a single Focus and to make matters worse for him, he forgets to Feat. I take some time (I'm quite a lot up on time) to consider my possibilities here. I can't get to the Behemoth with my Beasts. and the Bloodrunners are kinda too damaged to suficiently thin his ranks. The Raider Frenzies and charge an Uhlan. It looks like i'm a bit too much down on attrition, and i don't have enough hitting power or Recursion to turn it around. I do have a pretty decent assassination run though. I can get Two Void Spirits (Despoiler can spawn one off an Uhlan), Two Ferox and a couple of Essence Blasts on Irusk, which should easilly be enough, right? Gladiator charge and kill the Uhlan that engages the leftmost Ferox. Despoiler runs to get within 5" of the Uhlans blocking Irusk. The Ferox activates, walk and Pounce sees two of them in Irusk's back arc, the last onego for the kill on one of the Uhlans to get a new Spirit. Things starts going wrong though, as i can't seem to roll the 7+ i need to hit him in the back. I get in one hit which he use the Focus to get rid off. The Uhlan toughs twice to survive the last Ferox. Mordikaar activates, but i forget to give him puppet master first. This turns out to be pretty vital as i still can't for the life of me hit him, even missing on a boosted 6+ on an essence blast in the back. The second one hits but i roll miserably on the damage roll and only do 5 boxes. I do kill an Uhlan though, so i get the extra Void Spirit. Which now activates and calmly walk over to his Back arc, and Miss... I Check once again to see if there's any chance of me getting Radheim in to help, but he's half an inch too far away. Which means it's all down to the last Void Spirit. I need to do 12 Boxes of Damage at dice off 3 with Four Dice (Boosted from Charging and extra Dice from Annihilator.) Which means i need to roll 15. I hit! Damage dice are thrown and the first three shows 6, 5 and 2, the last one rolls off the table, and all i have to do now is roll a 2+ and the game is won. But the dice gods aren't with me at all at the moment, and the final dice provide me with a 1. With a sigh of Relief Behemoth and Winter Guard proceeds to shoot Mordikaar to pieces. Another annoying loss. And again, it's probably due to mistakes i made. A puppetmaster re-roll on the missed Essence blast would probably have seen the job finished. And i probably wouldn't be as far down on attrition if i had remembered to use apparition to have the range i needed to properly jam his Shooters. Granted, i was a bit lucky myself as he forgot to feat, but honestly, that shouldn't have made too much of a difference. I would have gotten one less Ferox in on Irusk, and one of the Essence blasts would have been from the Front instead, but other than that, the entire run would be pretty much the same. Not taking care to have Radheim closer to the action to help out with the run was a mistake as well. Still, it was an enjoyable game, and another great opponent, that even bought me a beer afterwards. And at least, i would not need to worry about getting list-locked.